Ever find yourself swooning at a totally beautiful rug, only to think: no way can I get that. I’d never be able to keep it clean! If that rug is cotton or wool, sure, that could well be the case. But what if it were made of another material, one that wore like iron and washed like a dream? I’m happy to say that there is. Meet polypropylene. Formerly used exclusively outdoors, like Sunbrella, this material is now gaining traction indoors, with people for whom durability and cleanability is paramount. (It’s also popular with the green set, as it’s usually made of recycled materials). Good news is that It’s getting easier and easier to find beautiful examples of polypropylene rugs. And even better, they’re usually far less costly than a rug of the same size made out of wool. Sure, they don’t have quite as luxurious a hand, so they probably wouldn’t be the best choice in a bedroom. But for any other room in the house--or many commercial applications--they could well be a great choice. I used the one above from Pottery Barn on a recent project, and the client was thrilled. One of the top priorities for her living room was that it be outfitted with things that could handle her pets and toddler. 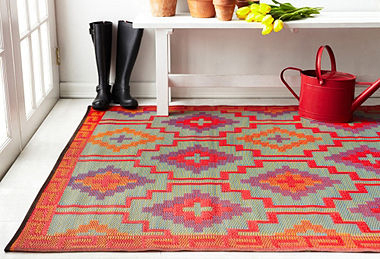 This rug is both tough and easy to clean, and she didn’t have to sacrifice style at all. It looks remarkably like a wool kilim. I’ve used ones by Thom Filicia for Safavieh on a couple projects and have been very happy with them too. I think their palettes are sophisticated, and they’ve worn very well. Their hand is less natural feeling--they’re a bit like narrow drinking straws woven together--but I find them comfortable to walk on even with bare feet. They’ve been a great choice for some office spaces I’ve designed, as they are so easy to clean. Ballard Designs also has a few that are made of this stiffer polypropylene, and they’re lovely too. They’d be especially good in an entry or mudroom, or even a dining room, as seen above. 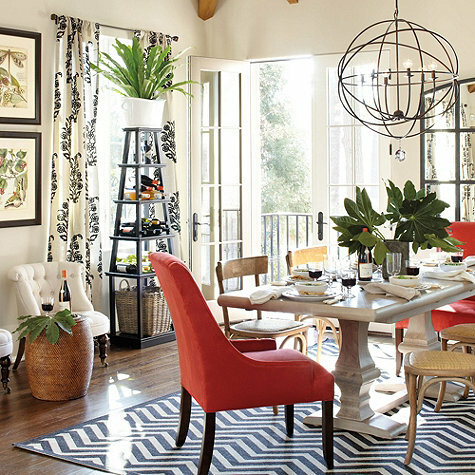 I also really like this one from Fab Habitat. Look at the way it makes this white entry pop! And some of my favorites are by Dash & Albert, which carries ones that are spot on matches for cotton dhurries. They’d be absolutely lovely in a living room. Of course, this type of rug is pretty casual in feel. If your taste leans more formal, but you’re still looking for a good choice for a home with kids or pets, I suggest checking out some well worn Persian rugs. But that’s for another post.